The Rebel God: Rethinking the authority of Scripture #3 - Context! Rethinking the authority of Scripture #3 - Context! Last time we looked at how many progressives deal with difficult passages by appealing to scholars who question the authorship. But does that really solve the problem? Let's be honest: If we have a problem with passages like 1 Timothy 2:12 it is not because of who wrote it, but the content of what it says. It is therefore disingenuous to act as if the issue here is one of authorship. Let's have the integrity to face the real issue: We find the statement to be wrong and hurtful, and that's why we wrestle with it. So how do we deal with Bible passages that seem wrong or hurtful to us? Of course the conservative approach would be to simply say "Well too bad, if God commands it, you just have to do it, no matter how profoundly immoral it may seem!" That of course a recipe for moral atrocity, and has repeatedly lead to exactly that. It has resulted in burning people at the stake, slavery, torture, mass killings, and on and on. It is a profoundly evil position to take. It is frankly demonic. Biblical scholarship is unfortunately little help to us here. 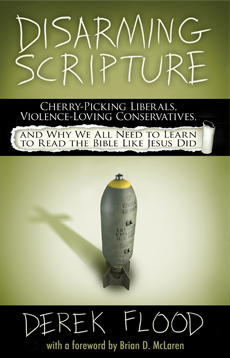 Ironically, while liberal scholars have had little problem questioning the historical reality of biblical claims (saying for example that the exodus never happened) they have resisted making any sort of assessment as to the moral claims of the biblical text and its underlying assumptions (for example it seems rather obvious to question the morality of claiming that God told you to commit genocide as the Old Testament does frequently). Biblical scholarship has consistently seen such ethical questions as off limits, and as a result pastors and students are given no tools in seminary with which to engage in what is perhaps the single most important task of biblical interpretation. This constitutes is a big fat glaring deficit in how ministers are being trained in our universities and seminaries, and leads one to question whether academic scholars are really the best people to train us how to read scripture as scripture. What we need are tools by which we can ethically engage with, and wrestle with the biblical text as responsible and thinking adults. Yet we have been persistently taught -- both in our churches, and by scholars -- that we cannot question the Bible simply on merit. We can't simply say "that's wrong" or "that's hurtful" or "that's awful" and instead need to say "that's a mistranslation" or "Paul didn't write that" or "that's taken out of context." Ouch. What we need to realize is that this is not making fun of the way fundamentalists or conservatives read the Bible, it's making fun of the way progressive Christians read it. In other words, this is stepping on my toes (and if you are reading this blog, it's likely stepping on your toes too!). So after having a good laugh at ourselves, I think we need to take an honest look and re-think how we are reading the Bible. Can we handle the tension it creates when we call a spade a spade in Scripture? Or to put it differently: Can we dare to have the integrity to side with the victims, to side with love, to side with true justice, even if that means that we may need to question the Bible in doing so? Because isn't that exactly what Jesus did all the time? And isn't that exactly why he got in so much trouble the the teachers of the law and the religious leaders of his time? As his followers, we need to take a look at where the priorities of Jesus were, and make sure that is also where our priorities are too. His priorities were not upholding a book, but on caring for the least and vulnerable, even when than meant he was accused of being a law breaker and blasphemer. What I want to propose is that it is perfectly legitimate to question scripture on ethical grounds, to question it on merit, and that if we look closely at how Jesus read scripture we will find that this exactly what he did. I struggle with the idea of a God created universal flood and also with the last plague (i.e. the death of Egyptian first born sons) before the Exodus. Like the examples in the video some things do not seem to have such easy explanations. How do you think we should view that last plague Derek? Imagined Israeli legend, historical truth or something in between? I wrestle with that one. It's interesting to consider the "plague of the first born" in the OT alongside of the "slaughter of the innocents" in the Gospels where Herod ordered the death of the first born Jews in an attempt to kill the newborn Jesus. The later is told as a deeply immoral atrocity, but how is it really any different from what God supposedly did in the law? Aren't they both unthinkable atrocities unworthy of Christ? And why is it that you are struggling with this? It's because you have learned to see from the perspective of the "other" and relate to the victim, to imagine these Egyptian children as... well... as little children! And where did you learn that perspective from? You learned it from Jesus because Jesus is constantly drawing us to consider the ones that we would normally disregard. So questioning these things is not the sign of a weak faith, it is the direct result of having a mind formed into Christ-likeness, it comes from spending time with Jesus and growing to have his heart for the lost and the other. So the question I want to ask is not so much "did this happen?" but more "does this reflect Christ?" which I think is more primary. For example: Do horrible and violent things happen through sickness, disaster, and war? Yes. Do they reflect Christ? Absolutely not. So while I think there is reason to suspect that the plagues were a made up fantasy of the ancient Israelites, what we need to say first is that it is simply wrong and immoral to attribute such things to God. "And why is it that you are struggling with this?" I think that I struggle because I do not want to dismiss parts of the bible that I do not understand as myth - even though they may be. "So while I think there is reason to suspect that the plagues were a made up fantasy of the ancient Israelites"
Are you thinking that the flood, the fallen walls of Jericho and the sun stopping in place are also made up fantasies? How about the deaths of Ananias and Sapphira? Did the early church make them up? Guess what I am wondering is how much of the bible should we consider as unreliable embellishments on actual events? "what we need to say first is that it is simply wrong and immoral to attribute such things to God." Is it wrong and immoral to say that God allowed evil in the world? If so, is there a lot of difference between allowing something and directly causing it? In the end the results are pretty bad. "Are you thinking that the flood, the fallen walls of Jericho and the sun stopping in place are also made up fantasies?" I'm acknowledging that there may be legitimate grounds for you to question that. For example there is considerable archeological evidence that the battle of Jericho never happened. However, I'm more interested in ethical evaluations than in historical ones. I other words, I don't want to just ask the question of history, I want to look at the meaning that is attached to these stories. At the very least I think we need to ask *both* the question of history (did it really happen?) and the question of ethics (what does it say about the values of the biblical author to attribute this to God's will?). "If so, is there a lot of difference between allowing something and directly causing it?" I think there is an enormous difference. But are those the only two possibilities? Great feedback. If I am hearing you right, the question that we should be asking is whether these things that are attributed to God (by the authors) in the scriptures are consistent with the image of God that we see in Jesus in the gospel accounts. So, in the case of Ananias and Sapphira, we should not see their deaths as an act of the Holy Spirit that caused fear to grip the folks that heard of it but as something else. And perhaps it was an embellishment of actual events? I do think that there is an enormous difference between allowing and causing evil because I don't see God as a micromanager. Yet for those who see Him as a micromanager the difference is not so great. For example they would say that God allowed the injustice of the Cross where I would say that He only allowed it in the sense that He allowed humans to have choice. Huge difference in my view. Interpreting the OT according to the image of God in the person of Jesus makes eminent sense. The only counterargument I can think of is that folks might say "Well yeah the Jesus in the Gospels was a suffering servant, but in Revelation, He kicks some major a-- and is pretty darn violent. What do you make of that, punk?" I'm being a bit goofy here, but you get the idea. It's a pretty formidable point to raise, and one worth addressing. I'd like to, but I don't have the tools. That's an excellent question, but too big for a comment. I'll take it up in my next blog post here. "If I am hearing you right, the question that we should be asking is whether these things that are attributed to God (by the authors) in the scriptures are consistent with the image of God that we see in Jesus in the gospel accounts." "So, in the case of Ananias and Sapphira, we should not see their deaths as an act of the Holy Spirit that caused fear to grip the folks that heard of it but as something else. And perhaps it was an embellishment of actual events?" Well, here I think you are moving too quickly to the question of history, focusing on it being "an embellishment of actual events." Now, that may indeed be true, however before we go there I think we should linger on the reason that we are struggling with this particular passage in the first place: We struggle with it because of the moral problems it presents (that is, the negative image of God it presents). So I think it is important that we acknowledge this and articulate these moral and ethical difficulties we see here. Working through this, articulating why exactly we see an incongruity with this particular passage and God revealed in Christ, or why we see it as hurtful being an example of religion based on fear and violence are deeply important things for us to be able to express together in conversation. The problem is that these things often remain assumed but unsaid and we jump strait to conclusions of "facts" and "history" when I think, from the perspective of those who are reading scripture as scripture, the most important task is to learn how to engage scripture ethically. Thanks for the great post and all the discussion. My question is this. How have you formed your understanding of the image of God that is used to determine what parts of the bible are ethically correct? Great response Derek! Perhaps a title for a future post could be "how to engage scripture ethically". I would love to hear more from you about that. The point for Christians should not be to try and defend scripture, but rather it should be to defend justice, mercy, love and compassion. The apex of our faith is not a book, but rather it's a person. I'm confused why you claim that biblical scholarship doesn't have anything to say regarding the ethics of the text? The number of scholars dealing with these issues are legion (feminist, post-colonial, reader response, peace work, biblical theodicy, etc. etc.). Yes, I'm glad you brought that up. These can all be seen as a response to the deficit in ethical engagement that has characterized biblical scholarship for the majority of it's history (and still does for the most part). So to be more precise, I should say that historical-grammatical exegesis does not engage the text ethically at all. Because of this different forms of reader-response readings (feminists readings and other ideological readings are essentially reader-response readings) have been used to supplement historical-grammatical exegesis. This is a relatively recent and positive addition to biblical scholarship that helps to deal with its inherent blind spot in regards to an ethical engagement with the text. I deleted your post because of the multiple links you posted which I do not allow on my blog. If you would like to comment (without links) on the above article you are welcome to do so. I've just discovered your blog today and wish to express my gratitude for what you're doing here. I was a Baptist pastor for a short time and left because I was convicted on numerous doctrines (basically all of them) that I had previously been convinced of. Sorry about that being cut off...my phone doesn't act right sometimes. Anyway, I was convicted about many things and changed my position on them, penal substitution being one of the main issues. I found your site while reading up on Christus Victor. I'm enjoying it a lot. Looking forward to reading more. Welcome Cody, I hope you find a safe space here where you are encountered with grace and have the freedom to ask hard questions as an expression of a healthy and compassionate faith. I have deleted the above post because it does not engage the topic at all, and instead is basically a commercial for another site dealing with a different topic. If you would like to engage in the topic here (even if you disagree) you are welcome to leave a comment. But it needs to be a comment rather than a commercial. "comment rather than a commercial" - right on Derek. 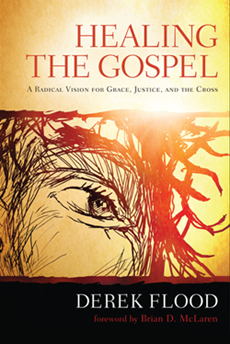 GET 2 FREE CHAPTERS OF HEALING THE GOSPEL WHEN YOU SIGN UP FOR EMAIL UPDATES! Questioning "Thus Saith the Lord"
Shouldering our souls with debt? And spoke with your celestial tongue? Why refuse to heal us now? Why won't you cast your pearls to sows? Why do I fear to ask these things? This website and its contents are copyright Â© 2000 Derek Flood, All Rights Reserved. Permission to use and share its contents is granted for non-commercial purposes, provided that credit to the author and this url are clearly given.